Think back…. What were you doing? It’s the era when frizzy perms were actually attractive, bubble gum jeans were cool and lunches were still tax deductible. Look out the 80’s are coming your way! 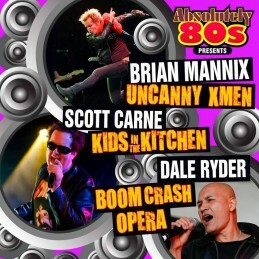 Absolutely 80’s are a fantastic road show born from the sold-out Countdown Spectacular of 2006. The Guys perform all their hits, in a 2-hour jam-packed show with a bunch of Aussie 80’s gems thrown in. It’s the 80’s reunion party not to be missed. Catch the biggest & best Australian 80’s stars together in one big show. See crowd favorites like Scott Carne, Brian Mannix, Dale Ryder, Paul Gray, Dave Sterry, James Freud and Sean Kelly, backed by an all-star 80’s band including members of Boom Crash Opera, The Sharp, Big Pig and The Black Sorrows.